Hope you are enjoying this wonderful summer as much as I am. This past weekend I traveled to the lovely city of Savannah, Georgia for my cousins wedding on 8/18/18 (that date was very popular this year for weddings). August being one of the hottest months of summer, in the south you expect it to be sweltering , and it certainly was this time of year. To keep cool during my visit I decided on wearing light colors, and light fabrics. I usually dread humid climates because I tend to perspire alot, so in order to avoid sweat embarrassment I dress accordingly. On my instastory I did a poll on this look to see if my followers wanted the full details on this complete outfit. 92% voted Yes, so as requested here are the details below. They are sold out now, but you can find a similar pair at Zara here. The Bucket Bag I am wearing is no longer available, but this bag would go great with this look as well. I enjoy shopping as you know by now, this cool outfit was definitely a steal. I loved that it was lightweight and comfy, so I felt at ease as I navigated through the Savannah streets during my vacation. Would you rock this outfit this summer? Let us know below what you wear to keep cool in the summer months. Are you ready for Summer 2018? Do you have your summer wardrobe already picked out? If you’re like me you probably have a ton of summer clothes you can wear already in your closet. The key to making old clothes look new is to add a new accessory to make your look pop. Summer begins tomorrow, June 21st and it’s about that time to get hot and ready with some bomb accessories. Need help with finding summer ready accessories? Then you’re in the right place! The EGL Fashion Squad is here to help! Check out some of our top picks of accessories you should rock All Summer 18. First up we have the ever so stylish and colorful accessory of a headwrap. Add this pop of color to any outfit to jazz up your summer look. You can get this cute headwrap and many others at WrapIsiko . This cute piece is only priced at $24. You should definitely add this to your accessory collection. Design By U is the perfect addition to your summer wardrobe. This necklace will definitely have you turning heads. Statement necklaces are great pieces to have, as well as statement earrings. Check out these electric blue fringe earrings from Atelier Sona. We all know fringe is on trend this year so it’s no surprise that we added this pair of earrings to our list of must-haves. You can’t go through summer without having a lightweight summer bag. This chic woven bag from Shop Bop is a must have Summer 18. We just love how this bag is easy to wear and can be paired with any summer look. You can pair this crossbody bag with jeans or your favorite maxi dress. Summertime is the prime time to add cool new shades to your collection. If you’re on a budget and want to add a trendy new style to your look, check out these sunnies from The Poshpeople priced at only $23. These shades will look great with your favorite bathing suit poolside or at the beach. If you have unlimited funds and want to splurge on a pair of sunglasses, then you should definitely get these Gucci Butterfly Sunglasses. 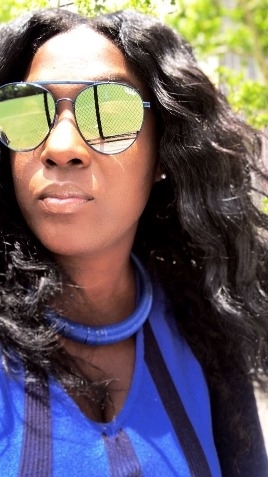 These sunnies have a vintage look and are great for the lady that loves oversized shades. Can’t you just see yourself wearing these on a yacht this summer? Which accessory will you be adding for All Summer 18? What will you be wearing these pieces with? Let us know below! We made it to mid week, Hump Day Wednesday! Thankfully the weekend is almost here! Oh how I love the weekend! Today on the Blog I wanted to sprinkle a little sunshine. The color yellow being the sunshine. This hue looks amazing on many skin tones, and is great on women of color. Yellow is now one of my go to colors. Pair that with ruffles and bam! We have my Living My Life Like It's Golden look. This dress is comfortable, flirty, and easy to move around in. I decided to wear this outfit on a night out on the town in Colombia. To complete my look, I paired my favorite earrings at the moment from The Poshpeople and clear heels with this dress. I received so many compliments that evening while strolling around town. Don't you just love a good ruffle moment? Are you interested in this same exact look? The great thing about this outfit is that all of the items are still available for purchase online. Check out the links below! What do you think about this yellow ruffle night out look? Would you wear this on a night out on the town?